Earith is a village and civil parish in Cambridgeshire, England. Earith lies approximately 10 miles (16 km) east of Huntingdon. 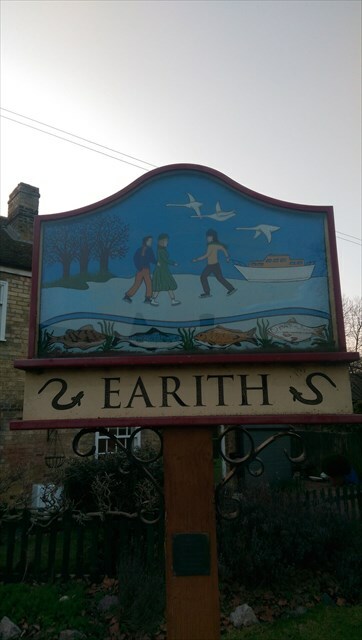 Earith is situated within Huntingdonshire which is a non-metropolitan district of Cambridgeshire as well as being a historic county of England. At Earith, two artificial diversion channels of the River Great Ouse, the Old Bedford River and the New Bedford River, leave the river on a course to Denver Sluice near Downham Market, where they rejoin the Great Ouse in its tidal part. At the 2001 census, the parish had a population of 1,677. To the north east of the village, between the Old Bedford River and the New Bedford River lies the remains of an English Civil War fort known as Earith Bulwark. It is believed to have been constructed as early as 1643, to fortify the crossing point of the River Great Ouse. Many fenland inhabitants resented the Royalists because they believed that the King's drainage projects undertaken by Dutch engineer Cornelius Vermuyden, had damaged their livelihoods (his Forty Foot Drain had been completed in 1637). Today, the fort is visible as a series of earthworks only, showing a square fort design with ditches and corner bastions. It is similar in design to Fort Nassau in the Netherlands. During the Second World War, a machine gun turret was built on the south bastion. In 1947, there was the "Battle of Earith Gap". Melting snow had built up in the Fenland waterways, unable to be released into the sea because of high tides. On 17 March a 50 yards (46 m) gap was torn in the river bank, and water poured out to flood the Fen farms for five days. Eventually the breach was blocked with amphibious vehicles while more orthodox repair work was carried out. The cache is just over the road from the village sign so please do not go climbing all over the it!